A Swedish-born journalist with a military and intelligence service background, Bertil Wedin lives with his British wife Felicity in Kyrenia on the northern coast of Cyprus. Formerly a permanent resident in America and England, he has spent most of his life outside his native Sweden of which he remains a citizen. His surname is pronounced as Vedeen in Swedish and as Weddin in English. 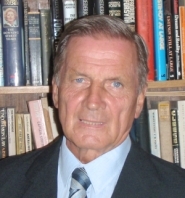 His military exp erience includes service with the United Nations Forces in the Congo in 1963 and in Cyprus in 1964 and 1965, mainly as a Military Operations and Intelligence Officer. In 1967 he was appointed as the Director of the Swedish Industry Information Institute and as the Editor of its daily journal for industrialists and diplomats. Having settled in England in 1976 he launched Industry International Research Institute and its weekly journal Industry International. He also worked with Brian Crozier, the strategist who had founded the London-based Institute for the Study of Conflict and later also started a private sector intelligence service. When Bertil Wedin and his family had settled in Kyrenia in 1985, he began to produce and present Magazine North, a current affairs and cultural radio programme over Radio Bayrak International. He is Middle East correspondent for Contra, a Stockholm-based current affairs magazine, and he has been a columnist for several publications in North Cyprus. Now, with the kind and great help of Chris Elliott and Margaret Sheard, the editors of cyprusscene.com, he is trying to launch his own online Bertil Wedin Newsletter.